Built at the turn of the 1900’s but entirely refurbished & refurnished in 2014, we offer luxurious yet relaxed Durango lodging minutes from downtown. Find your perfect room at our Durango bed and breakfast and book a romantic and adventure filled getaway. Named after the seasonal creek that runs through the rear of our property, this second floor suite in the original Farmhouse offers romantic and luxurious lodging in Durango, CO. The Lightner Creek Suite boasts a King size pillow top bed with down duvet, a wet bar and private deck. Luxury abounds in this spacious, spa bathroom complete with over-sized shower and air jetted bathtub for two . 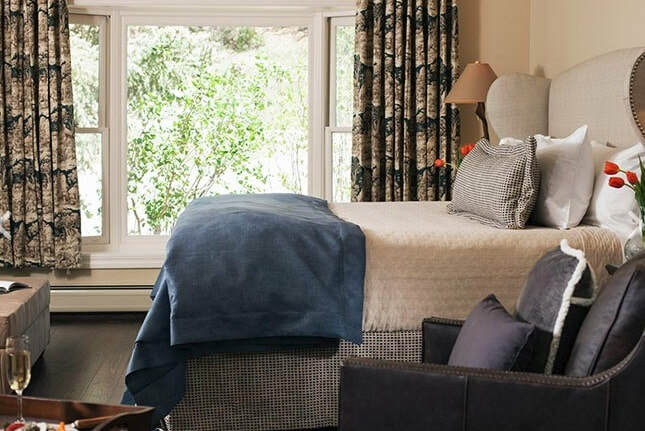 Enjoy exceptional lodging in Durango, CO in our beautiful Elk Creek Room. 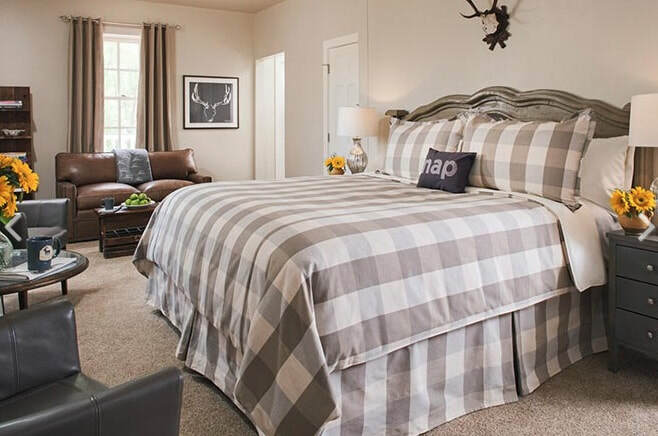 In classic Colorado style, this ground floor Carriage House Guest Room offers a king size pillow top bed and bunk beds – perfect for a group of friends or those planning a Colorado family vacation! 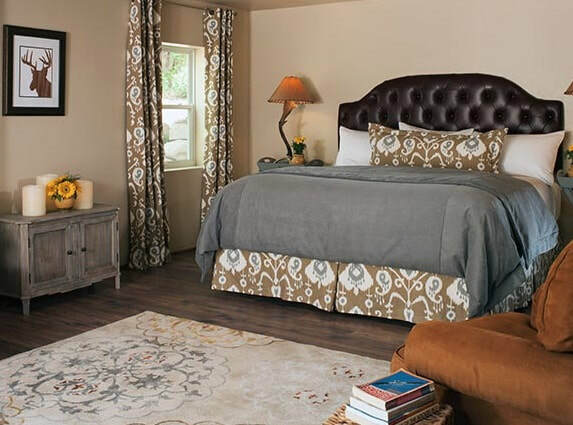 One of our ground floor Guest Rooms in the Carriage House of our Durango, Colorado bed and breakfast is the Bear Creek room. You will fall in love with the luxurious surroundings. With a pillow top king size bed you can settle in for a good night’s sleep after you soak the day away in the two person air tub. Don’t forget the gas stove for those chilly Colorado nights! With its log beamed ceiling and Colorado flair, this room sits atop the Carriage House and offers a small private deck and views of the creek. Tuck into the king sized pillow top bed sitting across from a gas stove while the kids take over the trundle bed under the gabled ceiling. accommodate a party of four. 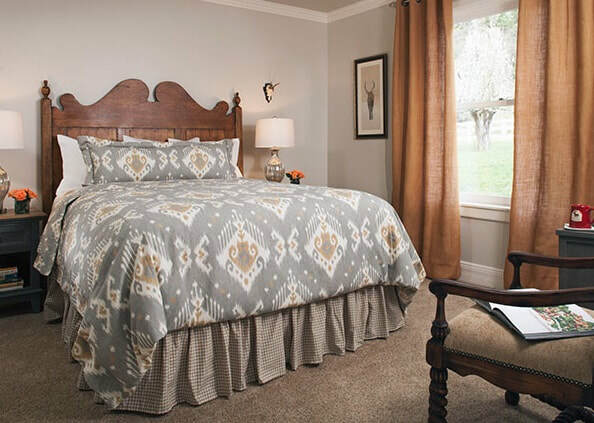 This second floor cozy, contemporary farmhouse room comes furnished with a pillow top queen bed, down pillows & down duvet, a newly renovated bathroom complete with Antlers’ signature citrus scented shower amenities, hair dryer & makeup mirror. ​Unique and romantic lodging in Durango is yours in our Shearer Creek Room. Nestle into your queen size pillow top bed with its down duvet in this newly renovated second floor room overlooking the rear of our property & Lightner Creek. With a distinct contemporary mountain feel, this cozy queen bedded room is named after a creek that runs on the eastern side of Missionary Ridge.